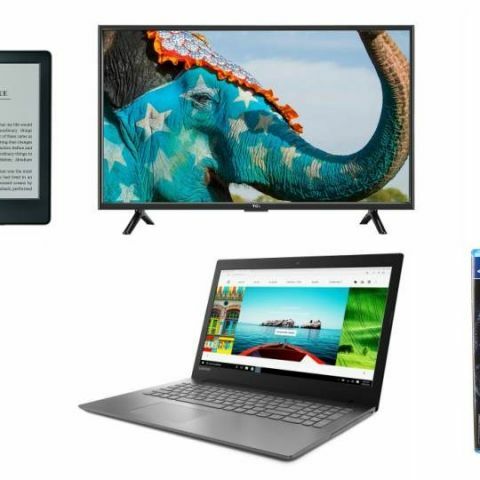 For today's deals roundup, we have some laptops, which are currently available at a heavy discount along with select Motorola smartphones whose prices have been slashed under the company's Moto Fest sale. There are some other gadgets worth checking out as well. The Bluetooth enabled philips headphones feature an over the ear design. It has noise cancellation and also supports the 3.5mm jack wired connectivity. You can buy it here. The 40-inch full HD LED TV features 2 HDMI, 2 USB ports and comes with 2 speakers with 8w audio output. Other features include Dolby Digital Plus Speaker and Adaptive Backlight dimming. The device can be purchased here. The Kindle E-reader features a 6-inch screen with a 167ppi density and sports Wi-Fi connectivity. It comes with 4GB internal storage and the battery lasts for weeks on a single charge. You can buy it here. The Moto Z2 Play has received a hefty discount of Rs 6,000 and it can now be purchased at Rs 21,999. The smartphone is powered by the Qualcomm Snapdragon 626 octa-core processor and features a 5.5-inch Full HD Super AMOLED display. You can buy it here. The Moto G5S Plus can now be bought at a discounted price of Rs 12,999 from Moto Hub and Amazon India. The smartphone features a 5.5-inch full-HD display and is powered by the Qualcomm Snapdragon 625 SoC with 4GB RAM. It sports a 13MP + 13MP dual-rear cameras and packs a 3000mAh battery with TurboPower charging support. You can buy it here. The Lenovo laptop is powered by a 7th Gen Core i5 processor with 8GB RAM and 1TB HDD. It comes with 2 GB discrete graphics card and you can buy it here. One of Konami's best gaming title will take you on Snake's mission to infiltrate Camp Omega with a "combination of stealth, wit and firepower." The game is set as a prequel to the highly acclaimed Phantom Pain which is the fifth part of the series. You can buy it here. The latest Acer Swift 3 laptop is powered by the 8th Gen Intel Core i5 Processor and comes with 8GB DDR4 RAM. It features a 15.6-inch display and is equipped with a 1TB HDD. You can buy the laptop here.